Sound Transit will brief the public and stakeholders on the latest West Seattle-Ballard concepts tonight, and what it shows could make a ruckus. So far, ST has tipped a preference for siting the Chinatown station and segment on 5th Avenue South. But a coalition of neighborhood groups and transit advocates is rooting for a 4th Avenue station and alignment. 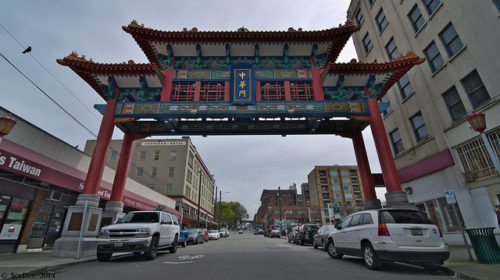 Maiko Winkler-Chin, the executive director of the Chinatown/International District Public Development authority (SCIDPDA), is one of the community leaders arguing for the 4th Avenue alignment. The First Hill streetcar project made the neighborhood’s businesses and residents wary of rosy government agency claims about construction impacts. Winkler-Chin says that some restaurants in the neighborhood were surprised when their water and electricity went out, and says that retailers suffered major drop offs in business due to sidewalk and street closures. Winkler-Chin says that Little Saigon’s retailers were hit particularly hard. Construction crews closed the 12th and Jackson intersection during the lunar New Year. That’s one of the Vietnamese diaspora’s most cherished holidays, and the neighborhood’s busiest shopping season. According to Winkler-Chin, Little Saigon merchants didn’t know that the closure was coming, and the closure depressed customer traffic and disrupted deliveries. No street level retailers or apartment buildings occupy the superblock between Jackson and Seattle Boulevard South on 4th. The parallel stretch of 5th features several large apartment buildings, street-level retailers and restaurants, and the west side of the Uwajimaya complex. As a result, Winkler-Chin says, the 5th Avenue project would be much more disruptive. Winkler-Chin also points out that the 4th Avenue alignment could reactivate Union Station as a public space and multimodal hub. Transit advocates, neighborhood groups and downtown leaders have long wanted to better integrate Union and King Street stations into the surrounding neighborhoods. I’ve lost track. Are we talking about LINK in a tunnel or underground? Because I can’t think of anything about LINK that can be compared to a “paving project”. It also seems to me that anywhere in Chinatown, since most of the neighborhood is fill, what the residents want dictates a lot less than the ground wants. Why are they assuming that a disruptive street-level project by SDOT on Jackson creates the justification of making ST spend hundreds of millions more? Is it just because it’s “transit”? Funny too how these problems about SDOT streetcar construction implementation not being done honestly never come up in the CCC discussions… isn’t it? What’s a few hundred million for 100 plus years? The station will be here when we’re all gone. 4th Ave is the right answer. Continuous integration with the existing line and sounder and Amtrak, under a street that has been a transportation backbone since it was built up over the mud in the 19th century. 5th Ave is the interface to the city—always has been. It’s where the stable soil starts, where safe residences are cheaper to build, and where businesses have thrived for 130 years. 5th between King and Jackson is in sad shape, but the solution is to grow it to welcome the next century of people, not to put some stairs to a tunnel. I’ve been on “Section 8” – which war did the Army say that, Civil War or the Revolution- for quite awhile so bear with me. Doesn’t the posting mention “Ballard-West Seattle?” I’ve got pics- unfortunately film- of the pile-driven logs a hundred feet long sharpened like pencils to support the concrete pads under the cement floor of IDS staging. I’m not an engineer, and getting glad of it, but my word to the community would be we’re going to put it where it won’t litter the core of the earth in its way down. Somebody straighten me out. Because I’m taking the bus from Ballard to West Seattle ’til I get this straight. Pushing transit farther away from the area’s business core may mitigate the negative impact of construction related disruptions, but it would also displace a transit system that, after completion, could bring traffic to their businesses. Winkler-Chin’s concerns are sensible and their complaints about the First Hill streetcar’s construction should be given serious consideration, but pushing SDOT for better planning and mitigation during future construction could be a better move for the ID’s businesses in the long term. There’s already a station at 5th Ave, right at the entrance to the neighborhood. The question is about encroaching on the neighborhood to save some money today, at the additional cost of having worse connectivity to the Sounder, Amtrak, and the stadiums for the next century or more. Mike, I like your argument that a 4th Ave station could be used to integrate LR with Sounder, Amtrak and the Stadiums, and I’m inclined to agree that would be a better approach for the new alignment, but if the question is providing service to the International District, then I don’t think the question should be framed as being “about encroaching on the neighborhood”, because in a sense the purpose of good transit is to “encroach” on the space it’s intended to serve. Certainly we should consider the merits of serving other areas with the new LR line, but if the purpose of the new line is to provide more service for the ID, 4th Ave is not a very good location for that. I really don’t see it making much of a difference from a neighborhood integration standpoint. You would have to look at the particulars — where exactly are they going to put each set of entrances and exits — to weigh the advantages of each. For the most part, it really is about construction at this point — where do you want to dig. A Fourth Avenue station is still to the east of the railroad tracks, and would presumably still share an entrance with the existing Link station. If anything, the key is to do a better job of connecting King Street Station with Link and the neighborhood. One block is too far to serve the neighborhood? One flat block that would presumably be through the revitalized King ST station? And I was under the impression that two blocks with a 50 ft elevation difference (1st & 3rd Ave) was perfectly fine. Just sayin’. B, I wouldn’t say it’s “too far”, but it is farther. And if the reason for moving the station farther away is to help ID businesses, my suggestion is that the businesses may be better helped in the long term by pushing for a closer station with better mitigation of construction disruption from SDOT. I actually agree with others’ comments about the benefits of a 4th alignment, but not for the sake of the International District. I think a 4th Ave station could make a lot of sense as a transit hub that connects the new LR line with the existing one and other transit systems – streetcar, Amtrak, Sounder and various bus routes converge in that area. TEMPORARY construction impacts should play little to NO part in our decision-making regarding the PERMANENT station alignment. The middle 6 paragraphs have nothing to do with ST or this station. They do point to yet another downside to our poorly designed and implemented streetcar – loss of confidence in all of our transit agencies and projects resulting in more headwinds for future projects of actual value. TEMPORARY construction can have a PERMANENT impact. Businesses can be displaced. Buildings can get torn down. Sure, they can be rebuilt, but if the result is a station that is no better (and a stop at Fifth is no better) then the additional cost of construction needs to be weighed against the loss to those businesses and the possible loss of character to the neighborhood. That is why both options should be studied in more detail. What will the end result be, what will it take to build it and how much will it cost. Putting it under 4th basically creates a true statewide hub, a 15-track superstation with nine tracks for Cascades and Sounder, two freight tracks, two green line tracks, and two red/blue line tracks. It rightfully returns beautiful Union Station to public space, passenger flow, and retail. It provides the city an opportunity to rebuild an aged viaduct at the same time. Yes it complicates the crossing of the lines, especially south of Chinatown. But that area is freeway underpass hell anyway, so honestly it’d be fine as a maze of tracks too. 4th is a better choice. Yeah, it does seem like the better choice. I really don’t see us getting anything out of a Fifth Avenue Station. It will simply be the I. D. station for that line. I don’t think anyone will think it is wonderful to be little further to the east. On the other hand, if this new station comes with a rebuild of the Union Station area as you suggest, then mobility is improved. Getting from Amtrak or Sounder to Link is much easier, while the public space (for everyone) gets nicer. Creating a 15-track super station also creates a single-point-of-failure for the entire system. Union station already is public space, and during rush hour the public plaza outside is already packed with people transferring between Link, Sounder, express & local buses. Moving the station from one side of US to another might reduce some transfer times, but it doesn’t make the space any more or less public. Union station is technically public space, but extremely underutilized. Go in there some time during the day. A couple of people sitting at tables. It could be so much more. Trying to transfer in this area with poor wayfinding, signal timing, high traffic volumes, gridlock, etc. is a disaster. There is huge opportunity to make this better and I hope we (i.e. Sound Transit) don’t blow it. Amen. I love this 4th Avenue station location, it makes so much sense. This connection between King Street Station, new Link station, Union Station hall, ID station sounds a lot like Los Angeles Union Station with that underground foot tunnel connecting many modes seamlessly with a grand station entrance. Would love to see something like that here. A 5th Avenue station would be really weird with the current ID station, theyd be literally right next to each other but totally independent from each other since they were built separate. No cross platform transfers. I agree about not making too much of the construction impacts and rather building the best transit design (I think 4th Ave). But ID station will be hell to use with construction on a 5th Avenue station severing access to most of the station. Call me a “selfish” rider, but I prefer an option that offers as little vertical movement as possible and lots of escalators when that’s required. If riders are paying fares and thus are the customers for decades to come, shouldn’t rider advocacy be a bigger part of this decision? This is a serious attitude problem that pervades this entire study. All the stakeholders represent groups that aren’t riders. Riders should come before neighborhood advocates. Yes. ST really should be looking at all of its projects through a lens of rider-satisfaction. it’s disappointing that they often seem to not do so. What about riders trying to get from Sounder or Amtrak to Link? From what I can tell, Fourth Avenue is the only option that improves that connection. This is exactly right. Moving the station over to 4th takes it farther away from the existing IDS station, thus making the transfer between LRT lines less convenient. Yes, Sounder-LRT transfers should be considered, but when you think about a fully built out system with 600,000 Link riders, the overwhelming majority of transfer activity will occur between the LRT lines at IDS and Westlake. The existing northbound IDS platform would connect directly to the mezzanine of the new station, providing very convenient access between the two lines. People also seem to forget that the southbound platform of the existing station is actually open to the bottom floor of Union Station, separated only by non-structural barriers. If the goal is to connect the station to transit and increase passenger flow within Union Station, a much less complicated solution is staring everyone in the face. And talk about disruptive: how does the city cope with 5-7 years of construction with the 4th avenue viaduct out of commission? That seems like a much more serious impact on the region — thinking of how many 4th Ave users there must be — than a cut and cover deck being installed along 5th. Sound Transit seems to be just getting the hang of the notion that transit stations should be IN neighborhoods, and CLOSER to people. Why go backward? 600,000 Link riders. That’s funny. That is *transit trips*, not Link trips. Come on man, do you really think that Link — which has less than 100,000 riders — is going to have 600,000 riders? Agreed. I went to an open house last round that wasnt in my residential area but to speak on behalf of what i thought just made the most sense for riders and it really felt like i didnt belong or have a valid voice because i didnt live in that area. WTF do old houseowners that dont use the system (and might not even be alive when it opens) get a voice in planning the transit station and routing but not transit riders? Those “old houseowners” pay property taxes to support the transit system and thus have a voice in the decision-making process. I think the point is not that “old houseowners” should have *no* say, just that their say shouldn’t be given more weight than actual prospective transit riders who are not fortunate enough to own a home in the area, and also pay in to ST3 via sales taxes and likely the MVET. By the standard of “who pays the most,” transit riders who don’t own cars would have the *least* say! Thankfully, local government is not a corporation. As a homeowner I pay in to local schools, but don’t use them. I trust the parents and education experts to know what makes the most sense for the local schools in my neighborhood. I’m rather disappointed that there isn’t a “split” option with northbound trains under 5th and southbound trains under 4th. That could open up the possibility of level platform boardings in each direction. These current schemes appear to require every transferring rider to change levels. The lack of transfer-friendly pedestrian design alternatives is one more example of rider-unfriendly ST design by a buch of “professionals” who don’t understand what it means to be a transferring daily rail rider. Wouldn’t that only really work if the existing C/ID station had been built with an island platform? Even if both tracks under 5th were N/B you’d still have to go up to the mezzanine and down to the other side to transfer. No, ST would only need to punch a tunnel through the wall behind the existing platform to connect with a new northbound platform (and tracks just east of that) under 5th. The same design could be applied under 4th southbound. The horrible thing that is in some of the current designs is that the new station is much deeper than the current one. If that’s the case, the vertical level changes become even more of a hassle. If you think that going down 40-50 steps to the existing platform today is bad, try going down at least 80-100 steps if not as much as 150 steps. No one on the stakeholder committee or on the staff seems to ever count steps when developing or reviewing alternatives! A deeper station would be very bad. Isn’t the *point* of a cut and cover tunnel, putting up with all it’s construction impact, that you don’t *need* to be as deep? Where is the open house? I guess I knew more information about the Ballard and West Seattle lines was coming out soon but I didn’t realize it was so close. The first one is on Saturday. So what is happening tonight? If the 4th Ave. alignment allows for a station on 1st Ave. or Occidental in SoDo, even more worth the extra $100M. SoDo doesn’t need 3-4 stations on the same street. I’m not going to attend a single presentation on this project until we’ve got at least one civil engineer on the speakers’ platform, and several more talking with people around the room. Because I’m not reading a lot of appreciation here of just how hard this project will be to design, let alone build. At the turn of the 20th century, Jackson Street was the north shore of a lagoon. The “fill” south of it isn’t even ground, but water with a little dirt in it. Too bad my “pics” are all on film, but shouldn’t be too hard to find the sight of hundred foot pointed logs being driven at an angle to support the concrete pads underlying the floor of IDS staging. It might be easier and less expensive to locate our station directly under the proposed “mid-town” station on the new Fifty Avenue DSTT. Maybe at Madison, Marion, or Columbia. Or if the ground will hold it a station there hollow out First Hill underneath proposed First Hill stop at Madison and Boren. Meantime, my own public meeting attendance on this subject wait ’til event-presenters get replaced with with civil engineers. Because what we do will be governed a lot more by what the planet itself has handed us than by political preference. Same holds true even more for, say a subway between Ballard and the University District. Guarantee that sight of a few plastic hard hats around the room will attract a good many of the local people with actual underground construction experience. The group whose attendance we most want- and whose absence really shows in too many projects. “Bore” versus “Cut and Cover” decision excellent example of necessary knowledge. Because the answer depends on things like surrounding soil, conditions above the surface, and underground water from leaks to creeks to rivers. Most of our decisions were already finalized when the first giant prehistoric dragonfly started to become a fossil. So at least put some “section drawings” (like you cut open the ground from the side) among the “plan drawings” like maps. Discussions and public comment will be a lot shorter and much closer to the point. Of the endeavor, not the piling. So you’re just going to leave all the decisions to the uniformed then? Not showing up just guarantees that the problem will continue. If you want civil engineers to be there you should show up and complain about the lack of civil engineers at the events.